NEW 2019 permits are NOW available. Go to your account and click on "Acquire Permits" if you already had a permit in the new system or go to "First Time Permit" if you have not had a permit in the new system (since June 2018). Check out the New Web Site Info page on the navigation bar at the top explaining some of the changes and how to set up an account, renew a recreation pass, or check-in and check-out. Wildlife Viewing Report - October 4, 2018. The 23rd Annual Youth Fishing Derby will be held at Remington Park on Saturday, May 18. NYS Department of Environmental Conservation is hosting Outdoor Days at the Lowville Region 6 office on on Saturday, June 8. Free Fishing Days throughout all of New York State June 29-30. Outdoor Adventure Day on Fort Drum on Saturday, August 17 from 10:00 am - 4:00 pm. Free, family-friendly, and open to the public. Passes valid through December 31, 2019 are available on-line. It is the responsibility of all Fort Drum Access Pass holders to know Fort Drum regulations. Fort Drum Regulation 420-3 Hunting, Fishing, & Other Outdoor Recreation ( Unofficial Version updated 9 Aug 2018 ) is available for the 2018-2019 season. Recreation maps and brochures are available from the kiosk in front of the Natural Resources Outreach Facility (Bldg. S-2507) off of Rte. 26 across from the Army Reserve Center (between Great Bend and Wheeler-Sack Army Airfield). The new system is designed to be used with a computer or smart phone which works better than a regular phone. However, if you only have a phone, the new Sportsman's Hotline number is: 1-855-267-9770. Recreationists must check-in before recreating and check-out at the end of the day. Everyone will have to check into a specific area(s). Due to the number of incidences of recreationists entering closed areas and for a general safety procedure, all recreationists are required to check-in to an open subtraining area. You have the option to check-in to three areas at a time. If you want to change areas, you will have to check-out of the first areas and check-in again to the new areas. If you are recreating only along a road (e.g., birdwatching from the road, going for a drive, etc.) and not entering a subtraining area, there is the option of "Road Recreation." You can now see what training areas are open by looking at the interactive map. First-time hunters must complete a NYSDEC Hunter, Bowhunters, and/or Trapper Education course before applying for a respective New York State license. Below are links to the different classes offered that can be sorted by distance from a zip code location. Trout fishing season begins April 1, 2019. Northern Pike, Walleye, Pickerel, and Tiger Muskellunge season begins May 4, 2019. Largemouth Bass & Smallmouth Bass season begins June 15, 2019. Youth turkey hunting season is April 20-21, 2019 throughout NYS. Spring turkey hunting season is May 1 - May 31, 2019. Gray squirrel hunting seasons begins September 1, 2018. Canada goose and Crow hunting seasons September 1, 2018. Early black bear hunting season begins September 15, 2018. Youth waterfowl hunting season is September 22-23, 2018. Ruffed grouse hunting season begins September 20, 2018. Archery deer and black bear hunting seasons begin September 27, 2018. Wild turkey, Cottontail rabbit, and Snowshoe hare hunting seasons begins October 1, 2018. Woodcock and Snow goose hunting seasons begin October 1, 2018. Duck & Merganser hunting seasons begin October 6, 2018. Crossbow deer and black bear hunting seasons begins October 10, 2018. Muzzleloading deer and black bear hunting seasons begins October 13, 2018. Regular deer and regular black bear hunting seasons begins October 20, 2018. The second regular Canada goose hunting season will begin October 27, 2018. Duck & Merganser hunting seasons begin November 3, 2018. The third regular Canada goose hunting season will begin December 26, 2018. 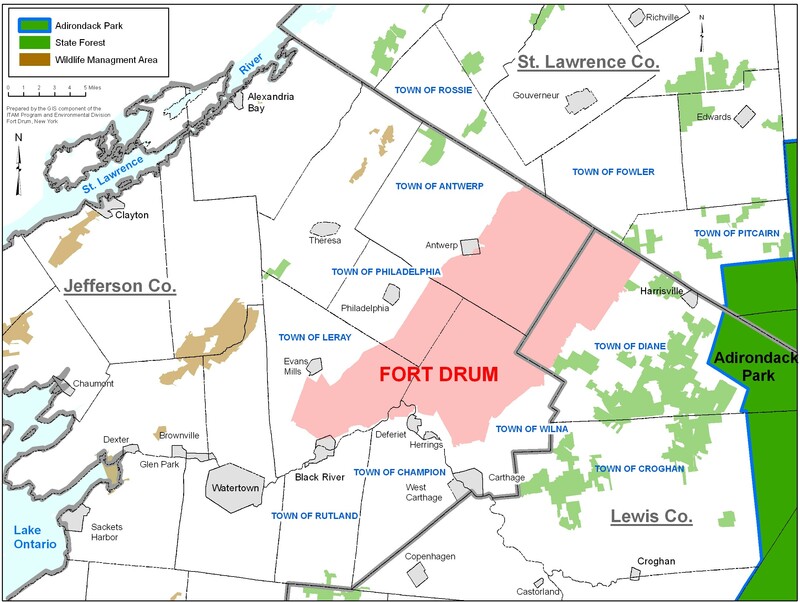 Fort Drum is a U.S. Army installation in northern New York State located in the northeastern corner of Jefferson County and the northwestern corner of Lewis County; St. Lawrence County borders Fort Drum to the north. Fort Drum is approximately 30 miles from Canada, 6 miles east of Interstate 81, and 10 miles northeast of the City of Watertown which is the largest U.S. city within a 50 mile radius. Fort Drum is the largest Fish & Wildlife Management Act (FWMA) Besides permanently prohibited areas, the only restricted access and activity on Fort Drum is hunting in the Cantonment Area and Training Areas 5E and 6C. Approximately one-third of the 8,000 acre Cantonment Area is open for archery hunting only by persons with Department of Defense identification. Training Areas 5E and 6C are open for disabled access hunting only. None of these areas are open for trapping, although fishing and other recreational activities are allowed in the Cantonment Area to anyone including the public.) Cooperator Area in New York State. Fort Drum signed the original agreement in 1959 to provide additional outdoor recreational opportunities to the public. Fort Drum is over 108,000 acres in size with approximately 70,000 acres open to everyone (including the public) for recreation. Fort Drum has 3 lakes and 4 ponds totaling 506 acres that are commonly fished—Indian Lake (184 acres) is the largest lake on the installation. Besides permanently prohibited areas, the only restricted access and activity on Fort Drum is hunting in the Cantonment Area and Training Areas 5E and 6C. Approximately one-third of the 8,000 acre Cantonment Area is open for archery hunting only by persons with Department of Defense identification. Training Areas 5E and 6C are open for disabled access hunting only. None of these areas are open for trapping, although fishing and other recreational activities are allowed in the Cantonment Area to anyone including the public. The area surrounding Fort Drum is generally rural with small concentrations of residential, commercial, and industrial areas mainly within villages. Although there are few federal lands near Fort Drum, state lands are numerous including state forests, forest preserves, wildlife management areas, and state parks. The majority of protected land is large forested tracts (primarily state forests, wilderness areas, wild forests, and primitive areas) located in Adirondack Park which is only 5 miles from Training Area 19 in the northeastern part of Fort Drum. 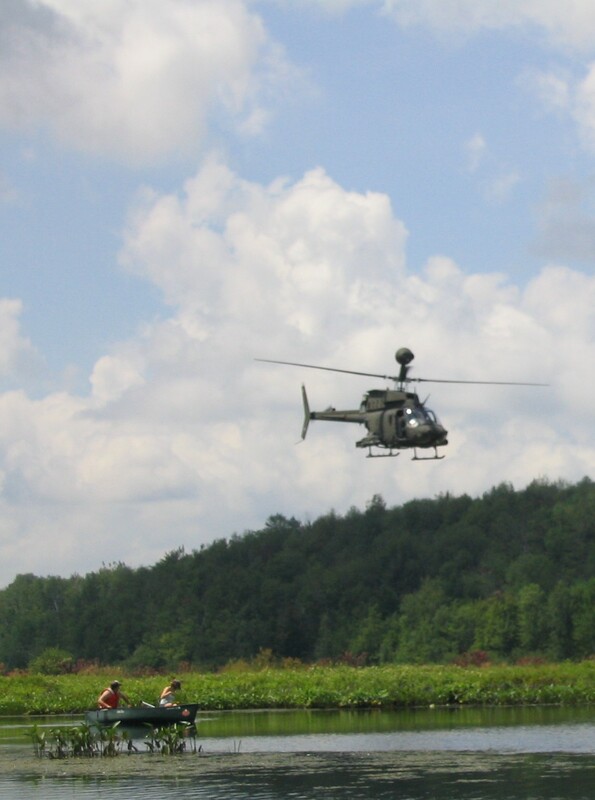 State forest lands border some areas of Fort Drum. The nearest state wildlife area is Perch River Wildlife Management Area (7800 ac) approximately 5 miles to the northwest of the Cantonment Area of Fort Drum. The natural beauty of the region along with world renowned fishing, boating, and winter recreation opportunities has made tourism a substantial part of the regional economy. This includes the Thousand Islands region along the St. Lawrence River approximately 20 miles to the north of Fort Drum, Lake Ontario approximately 16 miles to the west, and Adirondack Park to the east. The Black River running past Fort Drum and through Watertown is nationally known for kayaking. Fort Drum attracts hunters throughout the eastern U.S. See the New York State Department of Environmental Conservation (NYSDEC) web site for a guide to outdoor activities in New York State. Fort Drum is home of the 10th Mountain Division (Light Infantry). It is also the largest installation in the northeastern U.S. and serves as a training facility for Reserve and National Guard units in the region. The initial acquisition of land for Fort Drum occurred in 1909 and the most significant acreage—75,000 acres—was acquired in 1940. Fort Drum is an active military installation and recreational use is secondary to the military mission. To ensure sound natural resources management, an Integrated Natural Resources Management Plan(INRMP) was developed and first implemented in 2001 and revised in 2011. The INRMP was prepared in partnership and signatory cooperation with NYSDEC and the U.S. Fish and Wildlife Service (USFWS), representing the state and federal Sikes Act agencies, respectively.